Designed by the internationally renowned golf course architect Dave Thomas, The Roxburghe is an outstanding championship course and rightly rated among the top five inland courses in Scotland. 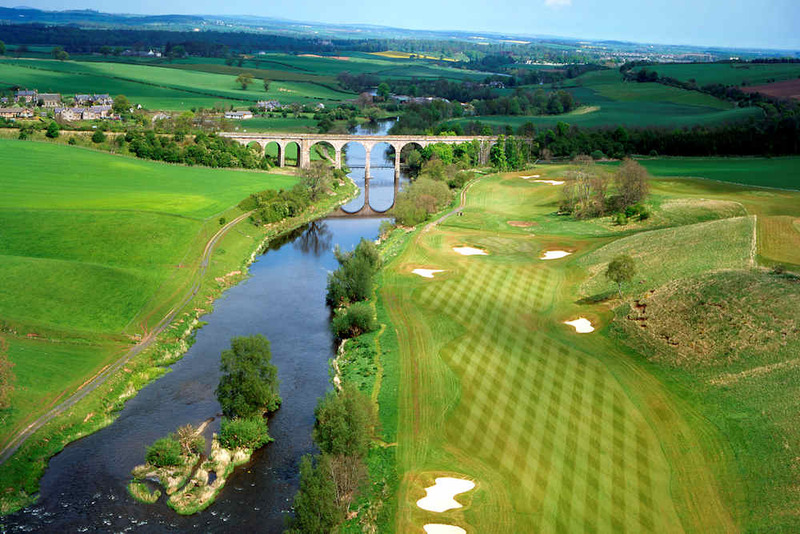 Set in 200 acres of stunning Scottish Borders countryside, the course opened in 1997 after being commissioned by the Duke of Roxburghe and makes the most of the existing natural features of the site to maximum effect. The par-72 course bears all the unique hallmarks of a Thomas design: numerous deep challenging bunkers, mature woodland to define fairways, dramatic water hazards and generous rolling greens. Scoring well requires a good driving performance from the numerous elevated tees to the generous fairways but it is recommended to choose the tee box you play from carefully before teeing off, with four options ranging from 5,660 yards to 7,111 yards. To highlight the course’s prestige, it has hosted the Scottish Senior Open along with the First Stage of European Tour Q-School. The signature hole is undoubtedly the par-5 14th hole, named ‘Viaduct’. Routed right along the River Teviot, a steep bank runs along the left side of the hole down towards the river, while the backdrop is the stunning and imposing viaduct. Its stroke index is 15, but don’t doubt that this hole is a serious challenge. Purchase a £20 food voucher. For £25 per person (based on 2 people). Purchase a £10 food voucher per person and 1 buggy. Bring a friend at a special reduced green fee of £40. Stay at the Schloss Roxburghe Hotel. Subject to availability and request.